United Rentals, Inc. URI has inked a deal to acquire BlueLine Rental — a top-ten equipment rental company in North America — from a private equity firm, Platinum Equity. The deal, which is anticipated to close by fourth-quarter 2018, will boost the company’s capacity in many of the largest metropolitan areas in North America. Notably, the transaction is in line with United Rentals’ strategy of ‘growing the core’ in a strong demand environment. Shares of United Rentals rose 5.1% on Monday following the news. The transaction is valued at approximately $2.1 billion. This all-cash deal represents a multiple of 6.7x adjusted EBITDA in the trailing 12 months ended Aug 31, 2018, and 5.4x adjusted EBITDA including cost synergies and the net present value of tax liabilities estimated at $169 million. BlueLine has a strong well-diversified customer base, serving more than 50,000 customers in the construction and industrial sectors, with a focus on mid-sized and local accounts. This addition will expand United Rentals’ footprint across the largest metropolitan areas in North America that include U.S. coasts, the Gulf South and Ontario. The combination will increase United Rentals’ fleet by more than 46,000 rental assets, with an original cost of approximately $1.5 billion. BlueLine has generated about $313 million of adjusted EBITDA and $786 million of total revenues in the trailing 12 months that ended Aug 31, 2018. Meanwhile, the company plans to pause its present $1.25 billion share repurchase program after the closure of the deal, in a bid to integrate its operations and assess other potential uses of capital. United Rentals expects the acquisition to be immediately accretive to its adjusted earnings per share and free cash flow generation. Additionally, the deal is expected to generate approximately $45 million of cost synergies in corporate overhead, operations and third-party re-rent areas. United Rentals will likely realize approximately $15 million of fleet and other procurement savings based on the combined spending. It remains proactive in expanding its geographic boundaries and product portfolio through acquisitions and joint ventures. In July 2018, the company announced the acquisition of BakerCorp International Holdings Inc. for $715 million. The deal, slated to close in third-quarter 2018, will boost the specialty rental business in North America and enable it to foray into some European markets. Additionally, the two most important acquisitions made in 2017— Neff Corporation and NES Rentals — boosted the quarterly results of the company. Project XL initiatives, prudent investments in fleet, accretive acquisitions and robust market demand also drove United Rentals’ growth. 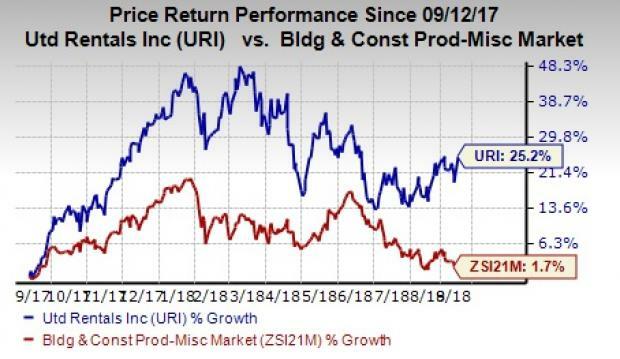 Shares of United Rentals, a Zacks Rank #3 (Hold) company, have outperformed its industry in the past year. Its shares have gained 25.2% compared with the industry’s rally of 1.7% in the said period. The company’s price performance is backed by a robust earnings surprise history. Impressive earnings performance, strong gains in volume and rates, along with robust demand will drive the stock’s performance in the near future. Some better-ranked stocks in the industry include Continental Building Products, Inc. CBPX, PGT Innovations, Inc. PGTI and Patrick Industries, Inc. PATK, each sporting a Zacks Rank #1 (Strong Buy). You can see the complete list of today’s Zacks #1 Rank stocks here. Continental Building’s earnings for 2018 are expected to increase 52.6%. PGT Innovations’ 2018 earnings are expected to grow 78.7%. Patrick Industries is expected to record 49.4% earnings growth in fiscal 2018.